“MGS Marketing has been using the services of Alan Lee and his Associates to service our residential rental properties." After years of discussion, arguments and handwringing, we have come to the realization that global warming and climate-change are serious issues that need to be addressed. Studies reveal that global warming is accelerating beyond previous forecasts, sea levels have been rising one-and-a-half times faster than forecast, and carbon dioxide (CO2) emissions have been accelerating from 1.1% per year to more than 3% per year. Profound changes have taken place, and the things we have taken for granted, like cheap electricity and water, are no longer applicable, therefore all of us involved in the design and construction of the built environment, need to adopt creative approaches to our endeavours. POOL SOLAR – Polypropylene panels absorb the radiant energy of the sun into the water circulating through them, thus raising the temperature of your pool. available in several sizes to fit various roof designs. Electricity. Electricity costs keep rising, while the supply is not always guaranteed; an off-grid system ensures constant, reliable, clean energy that saves you money every day. A grid-tied system will significantly reduce your electricity bill and carbon emissions. We have a number of options available; from simple, low-end solutions to mini-grids and everywhere in-between. Eskom keeping you in the dark? Paying too much for unreliable electricity? Looking for a company that can shed some light on the current load situation? Looking for a reliable, reputable operator? Water heating. For new-build projects: First, consult your architect to integrate the SWH system into the design. It is important to have the correct orientation, roof-pitch and location of hot water storage, as well as the correct sizing for the household’s consumption. 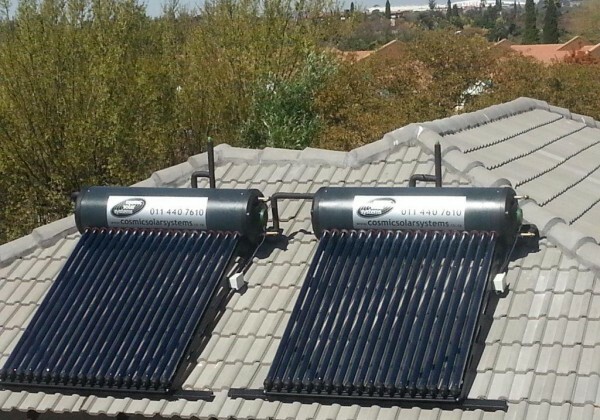 Cosmic Solar has the eco-logical solution. Generators, inverters, solar panels, MPPTs, Batteries. Induction water heaters use about one third of the electricity of conventional resistance elements. Heat Pumps use about half the electricity of conventional resistance elements. LED bulbs use a fraction of the electricity of incandescent or fluorescent lamps.